Japan's Kei Nishikori pulled off an upset Wednesday to reach the U.S. Open semifinals. He'll need to produce an even bigger shocker if he is to get to the final in New York. 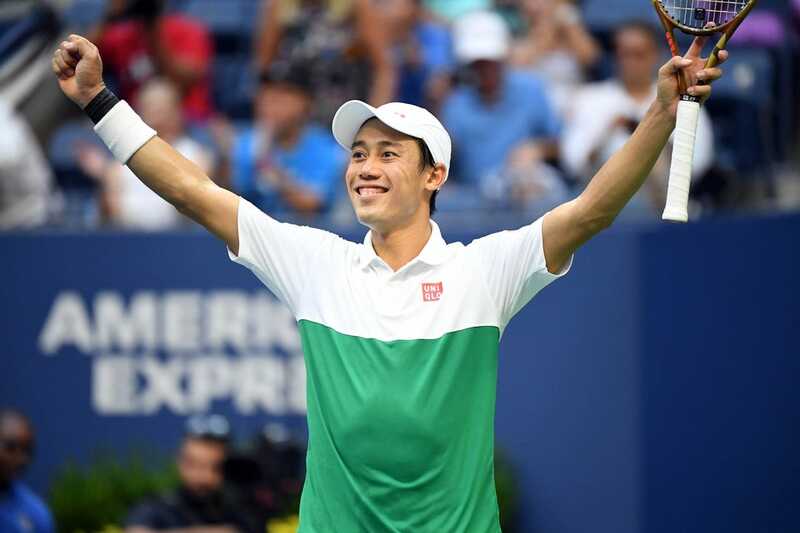 Nishikori, who outlasted seventh-seeded Croatian Marin Cilic 2-6, 6-4, 7-6 (5), 4-6, 6-4 in the quarterfinals, will next face sixth-seeded Serbian Novak Djokovic, who cruised past Australian John Millman 6-3, 6-4, 6-4 in 2 hours, 52 minutes. Djokovic, the reigning Wimbledon champion, won the U.S. Open in 2011 and 2015. The 21st-seeded Nishikori broke Cilic twice in the final set to claim the victory in 4 hours, 12 minutes at Arthur Ashe Stadium. The bout was a rematch of the 2014 U.S. Open final, where Cilic bested Nishikori in straight sets, 6-3, 6-3, 6-3, to claim his first Grand Slam title. Nishikori is into the semifinals of a major for the first time in two years. Djokovic is into the semifinals at the U.S. Open for his 11th consecutive appearance at the event. He is 14-2 in his career against Nishikori, though one of those losses came in the 2014 semifinals in New York. "I don't have a great record against Novak, but it's always been a tough match in the past couple of years," Nishikori said. "(I am) always excited to play Novak because it's a great challenge for me. It is always exciting to play him." Millman was fresh off a fourth-round upset of Swiss star Roger Federer heading into his matchup with Djokovic. He struggled from the start Wednesday, though, losing his first three games and never recovering. Djokovic had 20 break-point opportunities in the match, converting 16. He struck 30 winners and won the final three games of the third set after falling behind 4-3. "Very tested," Djokovic said of the match. "It's midnight now. Credit to John for putting up a great battle. After that kind of win to come out here and fight for three hours -- he deserves a round of applause." Millman added, "I gave it a crack. I definitely left it all out there today and pulled up a bit short. Novak's a champion. He's played a lot of Grand Slams, and he knows how to win them." Cilic had been pushed to the brink in his third-round matchup last weekend, rallying from two sets down to defeat unseeded Australian Alex de Minaur. He couldn't find the same magic against Nishikori, who grabbed the advantage in sets courtesy of the match's sole tiebreaker. The favorite broke Nishikori's serve twice on his way to breezing through the first set, and Nishikori returned the favor with two breaks of his own late in the second. In the pivotal third set, the two traded breaks leading up to the tiebreaker, where Nishikori opened up a 3-1 edge. Cilic battled back to storm ahead 4-3, but he lost each of his next three service points and dropped the set. The fourth set was a better showing for the Croatian, with a break of serve while not facing any breaks of his own, but 22 unforced errors in the decisive fifth set sealed his fate. "He started very well," Nishikori said. "I didn't feel like I was playing great. I had to stay tough, especially in the second set. I started playing better from 4-2. I tried to swing a little more, play aggressive and start working better from 4-2 down. "I am really happy to win and to go through matches like this. It wasn't easy, and I didn't feel like I was playing my best tennis today, but I fought through somehow, and it gives me big confidence." For the match, Cilic held a strong advantage in aces (19-6) and winners (57-29), but his 70 unforced errors compared to 45 by Nishikori proved too much to overcome. "I felt once we were getting into the rallies, he was slightly more consistent, and in ... maybe 60 percent of the rallies that he was the one that was dictating and creating chances," Cilic said. Cilic was playing in his third Grand Slam quarterfinal of the season. He lost in the final at the Australian Open and in the quarterfinals at the French Open.